Do you have any ideas for the Greenway Centre? 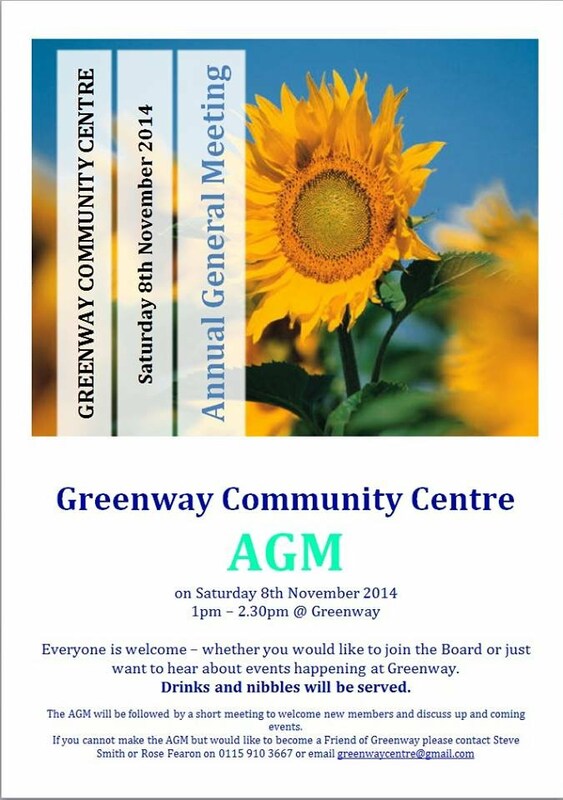 Get along to the Centre's AGM on 8th November! With funding opportunities decreasing in recent years It's been a challenge to keep the centre's head above the water. Nevertheless, they have a great team on the management committee made up from some dedicated residents that have a wealth of experience in working with community projects. On the ground Rose Fearon (manager) and her team have made a fantastic effort and have slowly but surely have helped to change the fortunes of the centre which will make a small surplus this year. resourced crèche, sports facilities, conferencing, and meeting rooms which can be hired for very completive rates. There is a dedicated music and arts facility with digital music studio run by the SEND Project. The centre also hosts the Bloomers day care centre for the elderly and the Nottingham Junior Attendance centre run by Nottingham Probation. However, they are looking for new ideas on how they can serve the community better so if you have any, please get involved. The best way to get involved is to attend one of the coffee mornings or join the committee. You can do this by attending the next AGM on November 8th 2014. For more details please see the poster above.